Yesterday I held my Open House for the launch of the Spring/Summer 2012 Idea Book. I thought I'd share the make-n-takes each of my guests created. It can either be used as a card, or simply add a couple of glue dots to the back of a gift card and use this as a gift card holder, by attaching the gift card onto the pull out cardstock piece. I can't take credit for the idea. I've seen many varieties of these coffee cup cards, and the inspiration for my card came from this one here. White Daisy CS Base: 4" x 9 1/2", scored at 4 3/4"
Stella Damask B&T: 4" x 4 3/4"
White Daisy CS Insert: 2 1/2" x 5 3/8"
White Daisy CS Lid: 3/4" x 4 1/4" (cut 2) (corner round), 1/4" x 4 1/4"
With the cardstock base folded and the opening at the top, mark with a pencil 1/2" in from both sides on the bottom of the card. Keeping the opening of the card base at the top, use your paper trimmer to cut from the corner at the top to the pencil mark at the bottom. Repeat for the other side. Open your card and run line of glue down both sides, keeping the top free of adhesive. Adhere your Stella Damask B&T piece onto the front of your card. Use scissors to trim off the excess on both sides. Adhere your paper crimped Lagoon cardstock piece onto the front of your card. Use scissors to trim off the excess on both sides. For the lid, glue the 1/4" x 4 1/4" White Daisy cardstock strip onto one of the corner rounded 3/4" x 4 1/4" pieces of White Daisy cardstock. Glue this onto the 2 1/2" x 5 3/8" White Daisy cardstock piece, making sure it is centered. Then glue the second corner rounded 3/4" x 4 1/4" White Daisy cardstock piece onto the backside. This will help give the lid a little extra sturdiness. 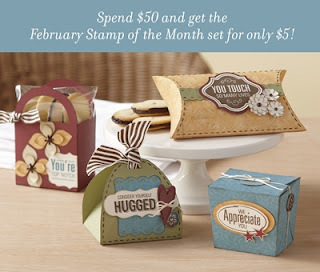 The sentiment I used on my card is from the February Stamp of the Month - Thoughtful Tidings. It's only available until February 29th. My guests also got to create this 6x3 card. I grabbed the same design from this A Bowwow card (originally created by Kandi Gallegos-Garcia) and just adapted it for the make-n-take. Love the coffee card! TFS the instructions. I know several sweet friends who would appreciate these. Hi...love your blog and your crafts with the patterns for them!